The InputGestureText property of RadMenuItem is used to display an input gesture that will execute the command tied to the specified item. It is placed right after the Header text of menu item. When using the predefined ApplicationCommands the InputGestureText is displayed automatically. 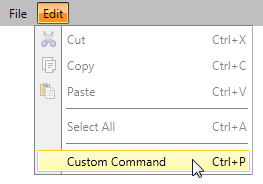 If you are using a custom Command the InputGestureText property should be set to the required shortcut manually. And here is a snapshot of the result.